The last of the “Four Gentlemen” or “Four Seasons”, this noble and cold -hearty flower is the last to bloom before the winter sets in. Come learn to paint these flowers in ink and color and in the spontaneous as well as outline forms. This class is also your introduction to painting leaves. Continue your journey in the way of the brush and pull together what you have learned from the first three of the Four Gentlemen (Bamboo, Plum, and Orchid) into your newest masterpieces! 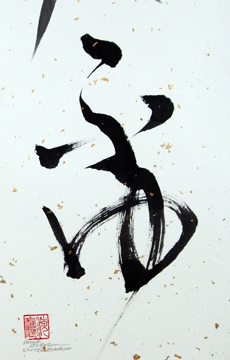 Subjects for this class will be Asian calligraphy and Lotus painting in ink and color. A magnificent water plant soaring above the water's surface, huge nodding leaves, many medicinal uses, a very fragrant and spiritual subject to paint. Step-by-step instruction will guarantee your success! "the workshop opened a door to creativity that was entirely new for me and with enormous amounts of satisfaction...it was wonderful"
This class is for students interested in learning about and using the tools and techniques of Chinese brush painting (aka Sumi-e) and calligraphy. Through Bruce’s demonstrations and hands-on brush painting projects using the “Four Treasures” of the artists studio, you will explore this ancient and meditative art thought by many to be the most refined and elegant. This course includes calligraphy and the painting of bamboo in ink and in color. NO ART EXPERIENCE is necessary. Through step-by-step instruction and class handouts you will leave the class with the ability to continue with more advanced subjects or to work on your own using outside resources. You will be provided with all the needed materials for use in class....artist quality bamboo brushes, inkstick, inkstone, and color. There is an additional $15 materials fee for one large roll of rice paper (paper fee does not apply in workshops). The skills you acquire can easily be adapted to other art forms such as ceramics, fabric decoration, and Feng Shui. Against a backdrop of meditative music , brush painting is a relaxing and enjoyable way to expand your creative abilities and take part in a several thousand year old tradition! "very inspirational, I want to continue with more advanced work"
This class is a relaxing, meditative exploration into the nature and techniques of painting the Plum blossom (similar to cherry or apple blossoms) in the hsieh-i (spontaneous) and outline styles. Through instructor demonstrations and hands-on painting learn how to paint this traditional flower in ink and color with elegant and beautiful results. The Plum blossom is the symbol for late winter and for nature walking down the path to the gate of Spring....now is the perfect time to add this fearless flower to your brush painting vocabulary! "the class taught me to be less stressed out and to work more from my feelings than fine details"
This class is a relaxing, meditative exploration into the nature and techniques of painting the grass Orchid (wild mountain orchid) in the traditional hsieh-i (spontaneous) style. Learn how to paint this traditional flower in ink and color with guaranteed success. The ultimate symbol for feminine grace, the orchid is also the symbol for the happiness of summer with its warm gentle breezes and care-free attitude....paint Orchid and be happy! "instructor was very knowledgeable, helpful, and has a great sense of humor"
This class is your introduction to traditional landscape painting. We will focus on the pine tree and how to paint it as the “host” of your painting. The pine is like a dragon hidden in mountain canyons or clinging to the rocky faces of cliffs....a true symbol of longevity and endurance! Techniques for painting rocks will also be introduced combined with some special wash techniques in ink and color. A continuation of and further exploration into traditional techniques of Asian landscape painting with emphasis on trees, rocks, mist and mountains while working with washes, gold leaf application, and crinkle paper techniques as well as a unique monotype technique for rice papers. "I waited all week to come to class, I loved it, enjoyed learning something new and the relaxation it brought with it"
"I enjoyed the step by step instruction; very relaxing, and beautiful results"
Flying, swimming, and walking about, these smallest, often unnoticed of life's diverse offerings can become energetic guests and points of interest in your floral and landscape brush paintings. Come learn how to paint these creatures in ink and color using traditional brush painting techniques. We will cover fish, birds, butterflies, dragonflies and a furry critter or two! "Bruce is well prepared, on-time, organized, kind and knowledgeable"
Shodo is the Japanese "way of writing". Participants in this class will learn the art of coordinating mind, body, and brush to design a series of characters that are statements of Zen philosophy (also known as "Koans"). It is thought that to be a good painter, one must be a good calligrapher...and to be a good calligrapher ensures one a long life! Come experience the gentle art of brush and hand-ground ink on rice paper while creating elegant statements of spirituality, beauty and artistry in both standard and cursive forms. In this exciting class we will combine the techniques of Zen calligraphy (shodo) and the methods of Japanese woodblock printing (Moku-Hanga). First we will explore and create standard and cursive Asian characters with bamboo brushes. handground ink, and rice paper. 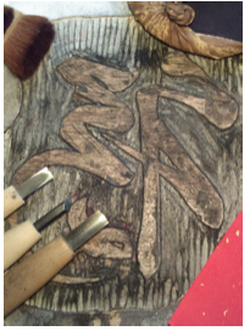 Next, we will carve a traditional woodblock with our chosen character/motif and, finally, using sumi ink, rice paste, and a hand held "baren" we will create our finished prints or greeting cards. This class is an introduction to an ancient and natural form of "relief printing"....which you are sure to enjoy! No previous experience needed. Materials provided.